The undergraduate program in the Department of Biochemistry at the University of Wisconsin–Madison combines modern, cutting-edge science with a strong historical foundation to tackle the largest issues facing science today. 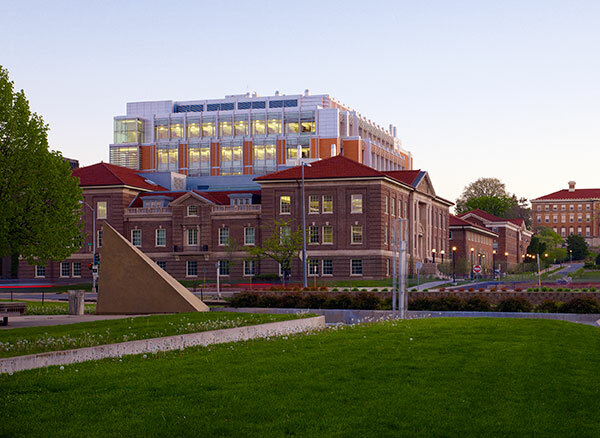 Since its origin in 1883, the department has consistently ranked among the best biochemistry departments in the country and been at the helm of important biochemistry research breakthroughs. Biochemistry is a broad science that studies the molecules and chemistry of life. Taking a molecular approach, it focuses on the structure, properties, and interactions of molecules such as proteins, nucleic acids, sugars, and lipids. Studies here are essential for understanding and finding cures to disease, improving the production of food and biofuels, and inspiring innovation in biotechnology. Graduates of the biochemistry undergraduate program go on to a variety of careers in science and science-related fields, such as laboratories that work in biotechnology or the pharmaceutical industry. The major is designed to fit the needs of students who wish to achieve bachelor’s level training, as well as those planning to pursue graduate or professional study, such as medical school or veterinary school. Students also gain an understanding of biochemistry to take to fields such as science policy or communication.